Singapore is a city of hybrids: pan-Asian, international, cross-cultural, and high-tech. 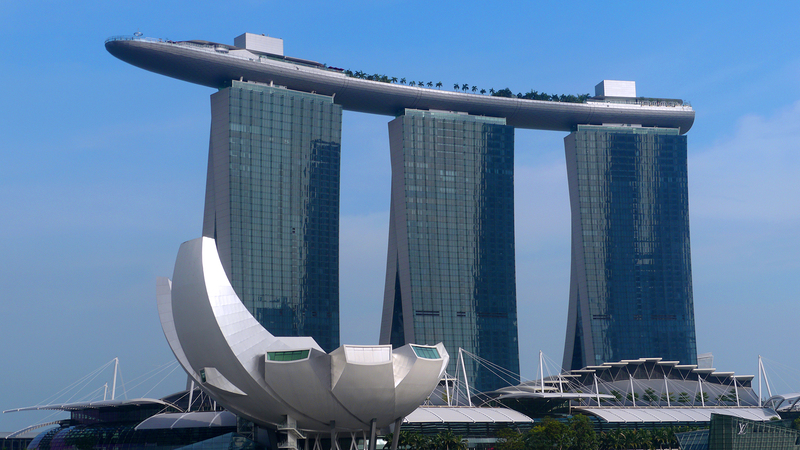 So it comes as no surprise that the Las Vegas Sands built the largest casino in the world on the edge of Singapore Bay – the Marina Bay Sands – a post-modern hotel-sculpture with a curvilinear ship atop three high-rise towers flanked by a lotus. In an effort to out Las Vegas Vegas, the ship-roof of the towers has an “infinity” swimming pool where the edge floats right up against the epic view of the downtown skyline downtown. This watery vertigo seems perfectly appropriate for this nation-island: so far from the desert of Las Vegas, but with a kindred embrace of extravagance.